This week we have Roshani's 10 facts about The Star-Touched Queen! 1. The name “Maya” means “illusion.” It’s also my Filipina mom’s Indian nickname! 2. Hindu mythology has many Otherworlds. The one that most inspired the Night Bazaar scene is a place called Patala, a sort of demon realm filled with beauty. 3. Many Hindu folklore tales have reincarnation aspects. For example, a princess in the epic poem, the Mahabharata, featured a princess (Amba) who is reborn as a man (Shikhandi) just to kill the man who had scorned her. 5. It’s not uncommon in ancient India for a king to have more than one wife. There’s also a famous example of the reverse situation with Draupadi, a princess in the Mahabharata who was married to all five Pandava brothers. 6. When performing funerary rites, the body’s feet are supposed to face south, which is where Hell (Naraka) resides. 7. In Hinduism, hell is just a temporary state of existence. Souls spend time in both Naraka (for bad deeds) and Svargaloka (for good deeds) before reincarnation. 8. Swayamvaras are marriage ceremonies where the woman chooses her husband from a line of suitors. 9. Kamala, the flesh-eating demon horse, was inspired by the kelpies of Scotch-Irish folklore. 10. Maya’s favorite dessert is rasmalai. Roshani Chokshi comes from a small town in Georgia where she collected a Southern accent, but does not use it unless under duress. She grew up in a blue house with a perpetually napping bear-dog. At Emory University, she dabbled with journalism, attended some classes in pajamas, forgot to buy winter boots and majored in 14th century British literature. She spent a year after graduation working and traveling and writing. After that, she started law school at the University of Georgia where she's learning a new kind of storytelling. The Star-Touched Queen is her first novel. 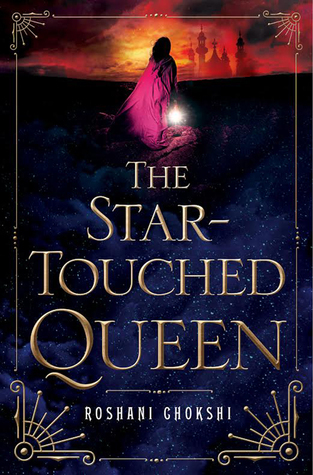 Roshani is giving away a signed copy of The Star-Touched Queen! US Only. Thank YOU for entering! Best of luck! Looks like a good read. Thanks for the giveaway! I really enjoyed this novel (: I'm excited for her next one!